MERRY ALMOST CHRISTMAS PEEPS !!!!! yay yippee yay ! i am SO excited for christmas !!! its so close to christmas and today i have a christmas-y post for you, to give you some quick and easy christmas gift ideas and wrapping inspiration. 1. for the colourful crafter - cute washi tape, available from many stores such as little paper lane and etsy. 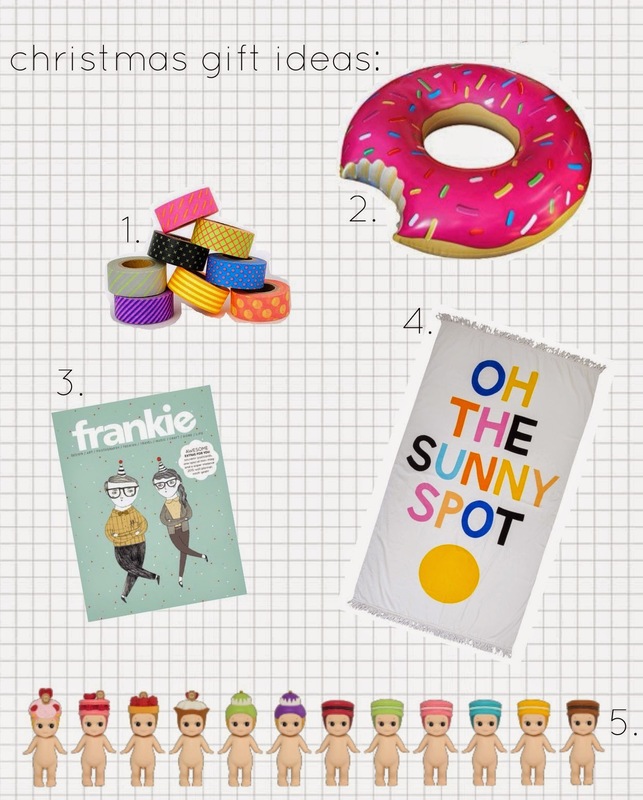 3. for anyone - frankie magazine is a quick and easy gift. perfect for designers, photographers and readers, it is available in most news agencies. AND the current issue comes with a mega bonus 2015 wall calendar ! 4. for the beach lover - castle and things 'oh the sunny spot' towel. i LOVE wrapping presents and it feels soooo wonderful to give someone a really good gift that has been wrapped oh so prettily ! this year my wrapping style is brown / white with a pop of neon and gold. thank you tullulah for my adorable christmas sonny angel !!! i hope you enjoyed that post ! have an amazing nearly christmas week everyone ! what are you hoping to receive for christmas ? Hope that you're Christmas was AMAZING & HEAPS OF FUN!